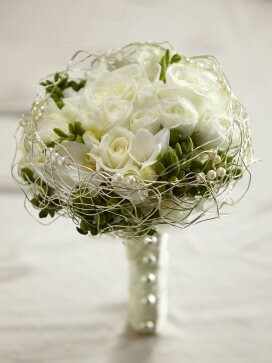 This stunning, romantic white rose and freesia arrangement is sleek, stylish and oh so very sophisticated! A true modern day romantic display straight from the angelic garden of grandeur. This breathtaking combination of white spray roses, hydrangea and freesia is perfectly accented with green hypericum berries. 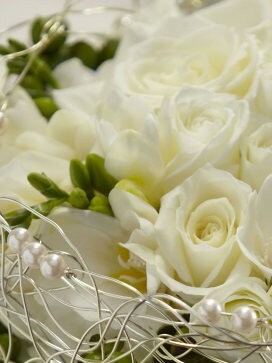 Elegantly presented with a coordinating yet contrasting gold wire bouquet collar set with ivory pearl pins. 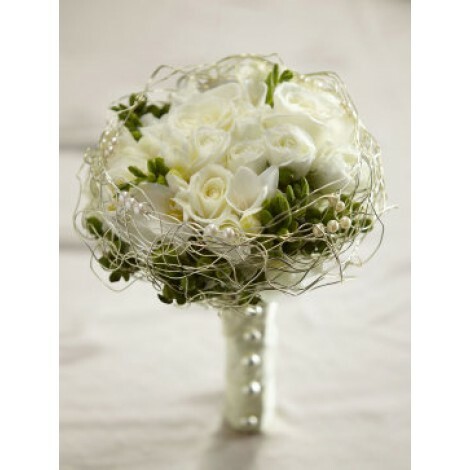 This hand-tied bouquet is completed to pristine perfection with ivory satin ribbon and domed silver buttons to create an even more exquisite effect. Approximate dimensions; 9 inches in diameter.